The book deals with a special syntactic and semantic phenomenon in Hindī, namely the constructions consisting of nominal and verbal constituents. Depending on the relations between them, some other words, e.g. postpositions, adverbs etc., can also be involved as components of the constructions. Their mutual relations correspond either to the object-predicate phrase, or such phrase may form a semantic, i.e. onomasiologic unit, which describes an action and is either the only name of the action, or a synonym of the simple verb. The study lists the most frequent syntagmas classified alphabetically according to the nominal components, which forms a kind of phrase book or syntagmaticon. It contains nearly eighteen hundred nouns and about five hundred verbs. 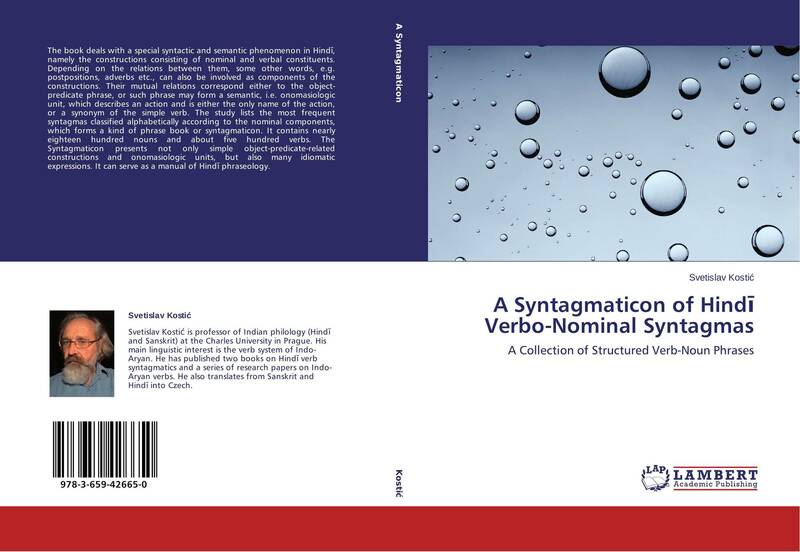 The Syntagmaticon presents not only simple object-predicate-related constructions and onomasiologic units, but also many idiomatic expressions. It can serve as a manual of Hindī phraseology.